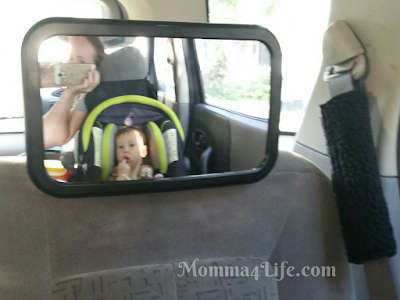 I am excited about this Back Seat Mirror By Omnitots this mirror is unlike others besides the wide view mirror this one swivels 360 it is really amazing. I wish I had one of these when my children were younger. 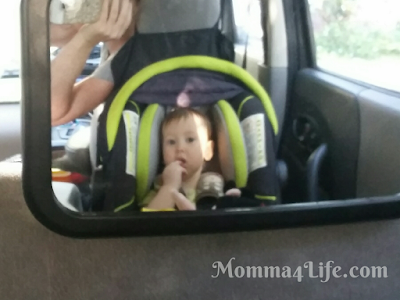 This mirror fits nice and snug around the head rest of any car and attaches with clips. As you can see from the photo this is a pretty big mirror which I am loving it shows so much more then just the carseat like normal mirrors do. It was very easy to put together and really sturdy. We just love it. When looking at this mirror it doesn't have a glare on it like most mirrors do. You can mount it both ways meaning you can mount it vertically or horizontally.